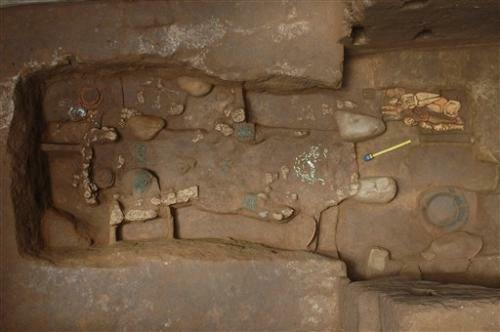 Experts said the find at Guatemala’s Tak’alik Ab’aj temple site could help shed light on the formative years of the Mayan culture. Government archaeologist Miguel Orrego said carbon-dating indicates the tomb was built between 700 and 400 B.C., several hundred years before the Mayan culture reached its height. He said it was the oldest tomb found so far at Tak’alik Ab’aj, a site in southern Guatemala that dates back about 2,200 years. Orrego said a necklace depicting a vulture-headed human figure appeared to identify the tomb’s occupant as an “ajaw,” or ruler. Is this little ancient toy the earliest evidence of the wheel? MessageToEagle.com– Today parents buy their children electric car toys to play with, but thousands of years ago the situation was somewhat different. Yet, this ancient discovery reveals our ancestors were aware of the wheel 7500 years ago! A stone car with two axles and 4 wheels dating from about 7500 years ago was found during excavations in the Kiziltepe district of the southeastern province of Mardin, are now on display at the Mardin Museum, Turkey. Archaeologist Mesut Alp said that the toy car, which is made out of stone, dates back to the late Stone Age and is thought to be 7,500 years old. Rumors are circulating throughout the world recently with the supposed discovery of one of the legendary Hall of Records in Egypt. The Egyptian government along with recently retired Zahi Hawass who ran the Egyptian Antiquities Department have adamantly denied these claims saying that no such building or chamber has been found. However, many researchers and even some archaeologists are saying that the chamber was indeed found but has been covered up due to the contents inside and what it would mean to both our understanding of history and Ancient Egypt’s history. According to legend and the renowned psychic Edgar Cayce, the Hall of Records are composed of three chambers spread throughout the world that contain the missing history of the lost continent of Atlantis along with the missing history of the human race. The three chambers are said to be located in Egypt (underneath the Sphinx’s paw), somewhere on the Yucatan Peninsula and one on the lost continent of Atlantis, which would be most likely sunken in the ocean depths still. Each chamber is thought to contain the history of the lost continent of Atlantis along with information on any of the surviving inhabitants of the legendary island. It was Cayce’s claim that there were small groups of survivors that managed to escape the destruction of Atlantis and it was these Atlanteans that brought civilization to both Egypt and Mexico. Cayce claimed that all of this information would be housed in these Hall of Records and would detail both the history before the destruction of Atlantis and the demise too. So, why would Egypt hide the Hall of Records? Obviously, the main reason would be the knowledge that the Egyptians did not develop civilization independently but instead were taught the concepts of it. This change in thinking would make the ancient Egyptian culture not as sophisicated as originally thought and all of their achievements would be questioned. Buildings such as the Great Pyramid and Abu Simbel would have to be questioned as to who was really responsible for the technology and ideas behind the building of them. Even the Sphinx would have to be questioned. Where is the evidence for the finding of the Hall of Records in Egypt? The first piece of evidence was found more than twenty years ago and was a ground penetrating radar scan that revealed a strange anomaly underneath one of the Spinx’s paws. The scan revealed what appeared to be a small chamber exactly in the location that Edgar Cayce had predicted the Hall of Records was to be found. The second piece of evidence and the most important are a network of caves and tunnels that run all around the Giza plateau. When these caves and tunnels were first discovered, both the Egyptian government and Zahi Hawass denied the existence of them. The caves run underneath at least two of the three large pyramids on the Giza plateau and run very close to right beneath the Sphinx. It is this cave chamber that runs very close to the Sphinx that the secret Hall of Records was located. The Hall was located behind about 5 feet of rock that separated the end of the cave chamber to the entrance of the Hall of Records. According to some sources, archaeologists were able to drill through and clear this 5 feet of rock and have gained access to the hall. But other sources are saying that once the archaeologists realized what they had found, they further sealed the cave chamber thereby hiding the discovery. So, has the Hall of Records really been discovered? And, if so, will we ever hear about the contents of what the chamber had inside it? My guess is that the Egyptian government will do everything they can to hide this discovery and unless they are forced to disclose, we will never get confirmation. Hopefully, I will be proven wrong. 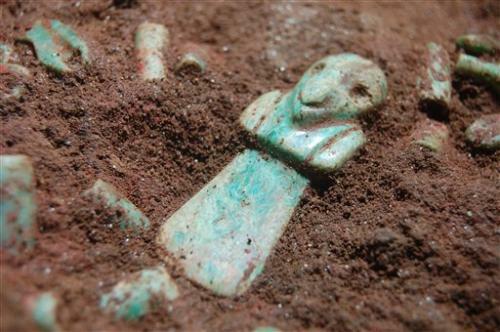 Prehistoric goddess figurine found at the bosnian pyramids,Visoko! Neolithic artifacts have been discovered, this month, in several areas of the Visoko valley by locals tilling their fields. In addition to artifacts such as pottery fragments and lithic tools, a prehistoric goddess figurine has been unearthed from Visoko’s fertile soils. According to Lithuanian archaeologist Marija Gimbutas, in Old Europe the pregnant Vegetation Goddess represented the annual cycle of germination, growth, and harvest. She wrote that ancient agriculturalists understood the parallel between grain seeds growing in the fields and new life growing in the womb. Representation of this parallel is found in many Old European cultures, including the Butmir culture, which existed in Europe between the 6th and 3rd millenium BC. The pregnant vegetation goddess, popularly known as the earth goddess, or “Mother Earth”, was one of the most-represented female figures in Old European art. Hundreds of pregnant goddess figurines, commonly known as Venus figurines, have been unearthed in European excavations sites dating back to the Neolithic age. Old European cultures generally connected the pregnant goddess with food, especially grain and bread. Archaeologists often find pregnant goddess figurines near bread ovens. Farmers throughout prehsitory and history understood cyclical (seasonal) time, and they took advantage of annual cycles with planting and harvest activities, which became rituals. During her lifetime, Marija Gimbutas identified a diverse and complex range of Neolithic female divinities, including Bird Goddess, Mistress of Animals, Snake Goddess, Deer Mother, Bear Mother, Birth-giver, Nurse, Pregnant Earth Goddess or Earth Mother, and many other female deities. Gimbutas thereby challenged the hypothesis of one “Great Mother” deity for the European Neolithic period. Gimbutas also identified a rich array of Neolithic male deities, such as the ithyphallic Snake God (a proto-Hermes), a bull- or goat-masked proto-Dionysos, Sorrowful God, a dying and rising Vegetation God, proto-Asklepios, Master of Animals or Forest God, and others. Pregnant goddess figurines were created from many different raw materials, each possessing unique physical qualities that were likely selected for their different attributes of availability, workability, and/or surface appearance. These figurines have been made from ivory, serpentine, schist, limestone, hematite, lignite, calcite, steatite, fired clay, bone and antler. While they have been the subject of scholarly attention for more than a century, a detailed understanding of the techniques used to create them is still lacking. Although today those female statuettes are called by most archaeologists “Venus figurines,” based on the assumption that they represent a standard of female beauty, Gimbutas explains that their function was more important than that of a Venus. These functions were the giving of life, the bringing of death, and the bringing of regeneration. According to Gimbutas, the large breasts and buttocks can be associated with the idea of regeneration and abundance. The central part of the access ramp of the Bosnian Pyramid of the Sun, ploughed up by the land owner. Unfortunately, modern farming is destroying dozens of precious archaeological sites in Bosnia every year, most of these sites dating back to Neolithic or Medieval times. Paradoxically, however, farming, which releases artifacts to the modern world, has been a vital force in developing archaeological knowledge. Modern non-intrusive farming practices should be applied in order to preserve Visoko’s historic landscapes. Modern farmers are the direct successors to the generations who worked and lived on the land before them. This valuable legacy is something local people should try to understand, cherish, and protect, for themselves and for future generations. But managing archaeological sites on cultivated land presents a particular challenge, since regular cultivation – or even a single instance of unusually deep ploughing – can damage hidden artifacts or remains. Hopefully farmers will begin to play a positive role in ensuring that the access ramp of the Bosnian Pyramid of the Sun, as well as other archaeological sites in and around Visoko, are passed down unscathed to future generations. Photo: Pottery fragment decorated in a green glaze Photo: Pottery fragment. Photo: Human bone unearthed during soil tillage. Photo: Neolithic vessel handle; Butmir culture. Photo: Neolithic vessel handle with decorations. Photo: Neolithic vessel handle shows typical decoration.